The atmosphere was like a fair, with live music, vendors, food and spectators – and the ‘main event’ in the middle: rows of easels standing ready for the artists. 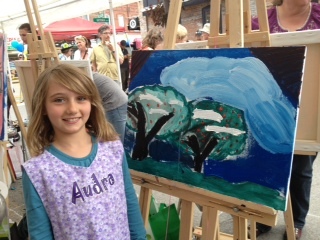 Audra was in the first round, meticulously painting her trees with care, and with a level of concentration that was magical. 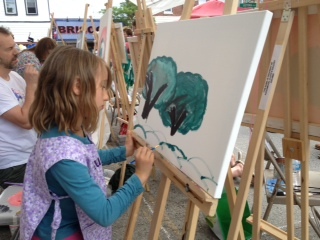 Amidst several questions of “how old is she?” (fielded by me – we didn’t want to disturb the busy artist! ), she kept on painting, with only the occasional little frown when her strokes turned out differently than she had anticipated. But she held wonderfully true to our reminder that with 20 minutes – little mistakes or imperfections would have to be ignored – and just keep painting! Watching Ethan was a little more nerve-wracking for me, as his attention to detail is always meticulous. He mixed and remixed his colours, looking for that ‘perfect shade’ (although I’m pretty sure I heard him comment to himself something to the effect of ‘but of course mixing colours is hard… I’m colour blind!’) But he, too, just kept going. I could see the astonishment on his face when he heard the announcement for the final few minutes – and if I could see into his mind, I’m quite sure the elaborately detailed painting that I would see there was not yet completed on the canvas. His first reaction following the call of: “5-4-3-2-1 ‘painters put down your brushes” was to wilt a little – clearly wishing he had more time. But with a deep breath and a brave smile – helped no doubt by the congratulations of onlookers – he quickly perked up. Each heat was then followed by a voting session by all in attendance, where each artist got to witness their ballot boxes fill with votes for their artistry. Eyes wide, Ethan and Audra excitedly reported that they were getting lots of votes. And their paintings then went on display for silent auction. 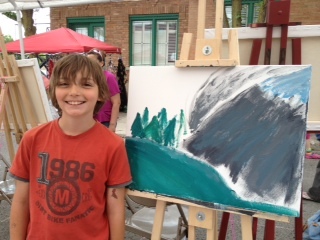 (“Mom, Dad – will you buy my painting? !” we were frantically asked.) Audra decidedly wanted to own hers, and Ethan was decidedly resolved to finishing his. Next, they excitedly (and somewhat incredulously) reported that ‘someone else wanted their paintings!’. With some surprise we checked the sheets – and it was true: we had been outbid on both of their paintings. 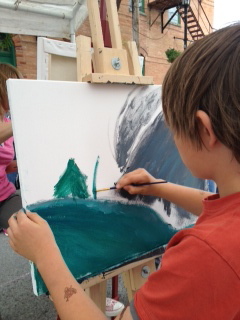 At the end of the day, we left the event – having pledged $60 on our own kids’ paintings. 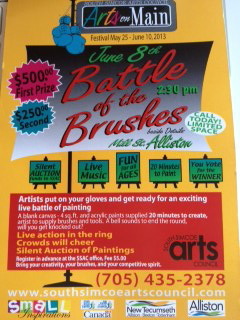 (all of which goes back to support the South Simcoe Arts Council, I might add). But even better, we left with happy kids, who felt both accomplished and inspired to create – and who are already talking about converting an area of our music room in the basement into an art studio. And while that may come with some mess – in the spirit of creativity and creating avenues of artistic expression – why not?! It was truly a fun day. That I way too cool. Looks like so much fun! Love the art work. so happy your children have been inspired to create! that is what it’s all about!! That was cool.Wish I could have attempted to paint something.Way to go Ethan and Audra.Very inspirational!